Check also a PDF version and an EPS version. How is this Table built? The order in which the energy levels of atoms is filled is well known: 1s, 2s, 2p, 3s, 3p, 4s, 3d, 4p, 5s, 4d, 5p, 6s, 4f, 5d, 6p, 7s, 5f, 6d, 7p... Although not obvious, it is not hard to discover the regularity behind this list, and this regularity is expressed by the stair-like structure at the bottom of the Table, that has to be read in the normal reading sense (i.e., from top to bottom and from left to right). 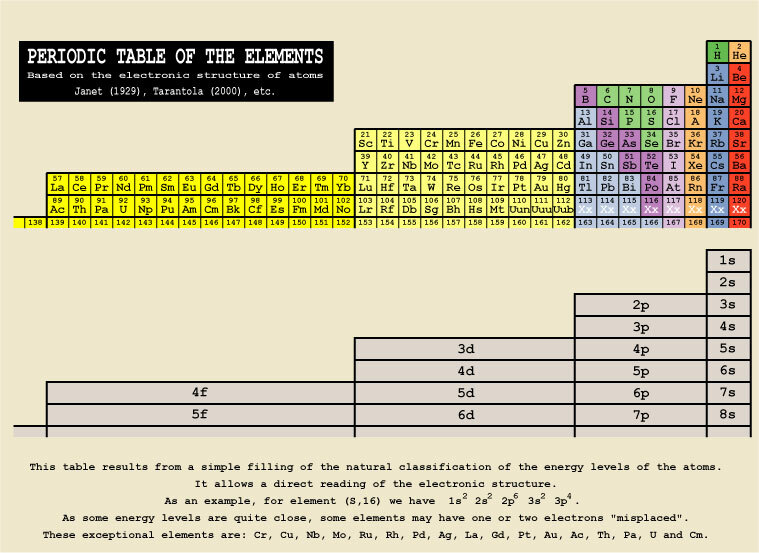 Placing in this ordered Table of Energy Levels the atoms that successively fill the energy levels (i.e., the consecutive atomic numbers) directly produces the "Periodic" Table of the Elements. Then, by construction, the particular electronic structure of a particular element can directly be read in the Table, as exemplified by the element S (see the text at the bottom of the Table). How can we pass from the standard version of the Table to this one? (i) move the two columns of the Alkali metals and the Alkaline Earth Metals from the left to the right, (ii) add the Lantanides and the Actinides, and (iii) place the He on top of the Alkaline Earth Metals. Although this arrangement, based on the electronic structure of the atoms, is quite natural, one may be surprised to find the Helium with the Alkaline Earth Metals, but the elements at the top of each column tend to have (at normal conditions) a special chemical behaviour. How can we pass from this version of the Table to the standard one? (i) take away the Lantanides and the Actinides, (i) move the two columns of the Alkali metals and the Alkaline Earth Metals from the right to the left, and (iii) place the He on top of the Noble Gases. Are there formulas allowing to compute the row and the column at which an element is placed? Yes. Click here. Check also a PDF version and an EPS version of this simplified Table. This form of the periodic table is not well known, as chemists persisist in using the more conventional form. As a result, this form of the table is rediscovered from time to time, by different people. This was my case, back in 1970, when I was a young student. I tried to publish this table, but the submission was always rejected, not because the editors thought that it was not original, but because "it was not sufficiently interesting as to deserve publication". Not yet used to fight against editors, I went back to prepare my entrance to the University. Many years later, with the arrival of the on-line publications, I posted this table at the Chemistry Preprint Server, (CPS: chemistry/0009002), with the hope that this form of the table becomes popular. (This e-publication can be accessed at http://preprint.chemweb.com/chemistry/0009002/; you may need to register, but it is free; you can also access a copy of the e-article (PDF file) by just clicking here). Since the time of this e-publication, I have received many comments of the happy people who discover this form of the table. Also, as it could not be otherwise, I have received comments that have helped me to trace back this table to its origins. It seems to have been first discovered by Charles Janet in 1927-1929 (click here to see a 1929 Janet's publication). Edward G. Mazurs (1957) gives many historical details on the Periodic Table (click here to see his comments on Janet's table). More recently, Mark J. Winter (1994) mentions this table in a book (click here for a PDF version of the figure from Winter's book). Please, tell me if you have more details on this table. The Janet fom of the periodic table is obtained when classifying the energy levels of the atoms in the order they are filled when passing from one element of atomic number Z to the next, with atomic number Z+1, and so on. Let us call this the first ordering of the atomic layers. Alternatively, in the successive ionizations of a given atom, the order at which the enegy levels give electrons is not just the reverse of first ordering (atoms are complex objects). This second ordering of the atomic layers can be obtained from ionization data. While the first ordering gives the Janet table shown above, the second ordering gives the following table. For more details see the paper CPS: physchem/0201017 (Tarantola, 2002) at http://preprint.chemweb.com/physchem/0201017 (you can also obtain it here). See also the paper CPS: physchem/0201007 (Le Cornec, 2002) at http://preprint.chemweb.com/physchem/0201007 (you can also obtain it here).